I would like to draw attention to an interesting décor that I recently found on a sherd. It is something that I have never seen on Neolithic pottery before. 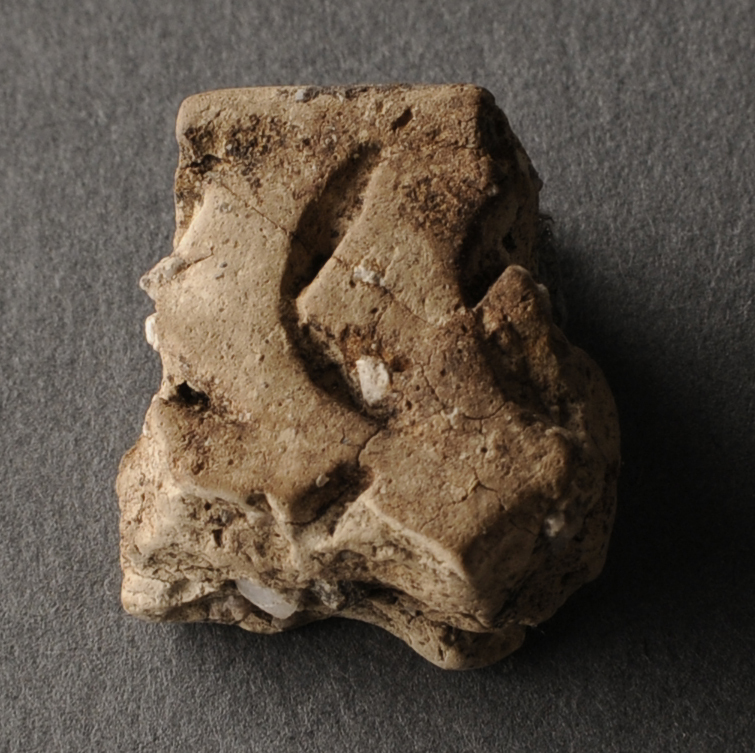 The specific sherd is presented above. It is a flat rimmed sherd. The colour is light (yellow-grey) and the ware is well homogenized and well burned to that. The ware reassembles funnel beaker sherds found at the pile dwelling. Sherd FID1184991 decorated with crescent shaped impressions with narrowing centres (V33). The vessel wall as well as the rim have been decorated. The décor of biggest interest is impressed on the vessel wall and was applied in at least two rows directly under the rim, and it is to my knowledge unique for the Alvastra pile dwelling. I have described the décor as halvmånformiga intryck med avsmalnad mitt in Swedish, i.e. crescent shaped impressions with a narrowing centre in English – a name that was very hard to decide upon, since it is different from all other décors that I have seen so far and it is hard to understand how it was made. I finally chose a name that described the shape of the décor. I have added the décor to the list of decoration elements that I work with (Browall 2011) and it has received the number V33. The rim has also been decorated with element R2 (see Browall 2011) which is a rather common rim décor at the site. Sherd FID1184991 decorated with crescent shaped impressions with narrowing centres (V33). Image altered by the author to highlight décor. When analysing the décor and trying to understand it, I twisted and turned the sherd in several ways and I have come to the conclusion that the impressions are made with one tool. In contrast to being the result of two impressions applied in an angle. I argue this since the characteristic shape is not entirely symmetric – which is easily seen through a microscope. The upper wing, if you will, has another shape compared to the lower wing. If the element had been made by means of two applications with one instrument the wings should have an identical shape but they have not. Moreover, the crescent shape connects both wings through an unbroken half circle. With all probability the crescent shape would have been very hard to maintain if the element was obtained by means of two impressions. Where does that analysis take us? 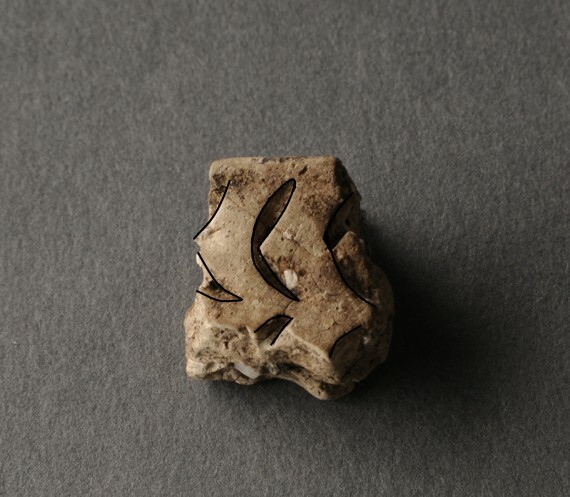 Well, if it is correct it means that we should keep our eyes out for a distinct decoration tool most probably of bone that could have made these elements 5 000 years ago. I think that the décor may have been done with a small long bone cut in half and then carved to obtain this peculiar and very nice décor. 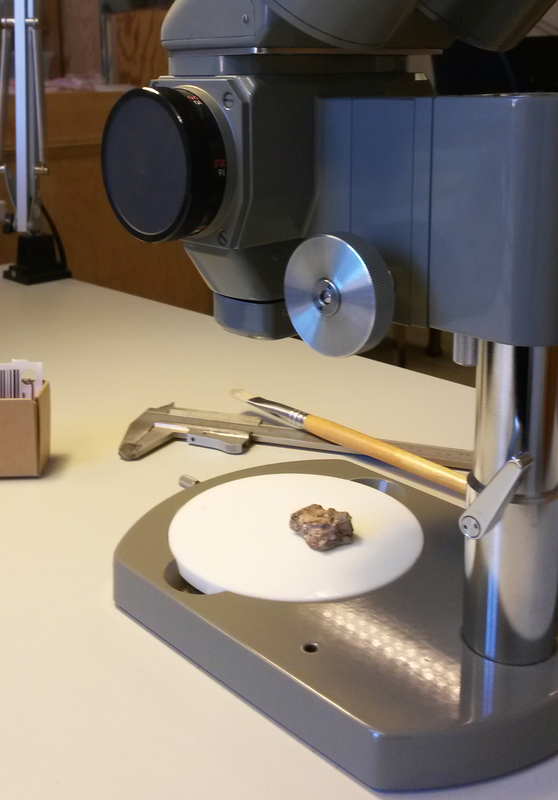 Hopefully we can find it in the bone material later in the registering process. Sherd FID1184991 when studied in the microscope. If anyone recognizes the décor from other ceramic assemblages it would of course be of great interest to hear about it!